Denise Riley is renowned as a feminist theorist and a poet and for her remarkable refiguring of familiar but intransigent problems of identity, expression, language, and politics. In Impersonal Passion, she turns to everyday complex emotional and philosophical problems of speaking and listening. 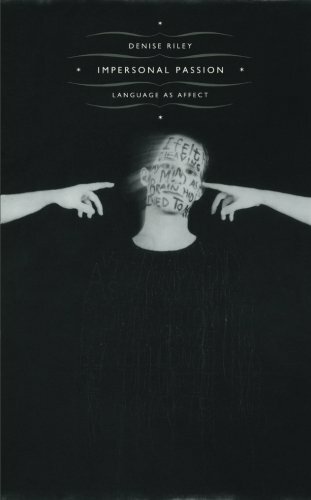 Her provocative meditations suggest that while the emotional power of language is impersonal, this impersonality paradoxically constitutes the personal. In nine linked essays, Riley deftly unravels the rhetoric of life’s absurdities and urgencies, its comforts and embarrassments, to insist on the forcible affect of language itself. She teases out the emotional complexities of such quotidian matters as what she ironically terms the right to be lonely in the face of the imperative to be social or the guilt associated with feeling as if you’re lying when you aren’t. Impersonal Passion reinvents questions from linguistics, the philosophy of language, and cultural theory in an illuminating new idiom: the compelling emotion of the language of the everyday. View More In Women's Studies. If you have any questions about this product by Brand: Duke University Press Books, contact us by completing and submitting the form below. If you are looking for a specif part number, please include it with your message.